For the county, see Changhua County. 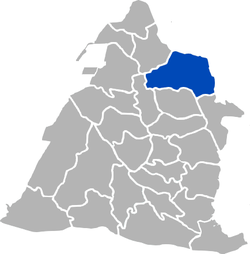 Changhua, officially known as Changhua City (Chinese: 彰化市; Pe̍h-ōe-jī: Chiang-hoà-chhī), is a county-controlled city and the county seat of Changhua County in Taiwan. For many centuries the site was home to a settlement of Babuza people, a coastal tribe of Taiwanese aborigines. Changhua city is ranked first by population among county-controlled cities. Historically, Changhua city was a base for the Hans when they invaded Taiwan and to defend from the Taiwanese aborigines, a fortress built out of bamboo was made. Thus Changhua has earned its name as "Bamboo Town". Changhua is best known for its landmark statue of the Buddha. At 26 metres tall, the statue sits atop Bagua Mountain overlooking the city. The main walkway up to the giant is lined with statues of figures from Buddhist lore. Another site of interest is Taiwan's oldest temple honoring Confucius. 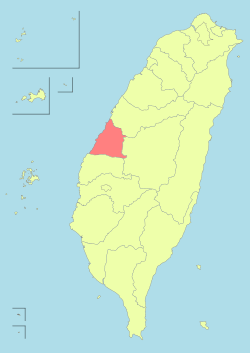 After the handover of Taiwan from Japan to the Republic of China on 25 October 1945, Changhua City was established as provincial city of Taiwan Province on 25 December the same year. On 1 December 1951, it was downgraded to county-controlled city and became the county seat of Changhua County until today. The temperature of Changhua city on average is 22.4°C, annually, with July being the hottest and January being the coolest. Annual rainfall is 1723.4 mm, June being the wettest and November being the driest. Rainfall decreases westward closer to the coastline. Changhua city is one of the more developed areas of Changhua county, from 1970 a trend of industrialization has been ongoing. This is reflected by an increase of factories in Changhua and decreasing amount of agricultural fields. However, Changhua city has a considerable amount of pollution as a result of this industrialization. From a poll in 1992, 43.2% of respondents work in the servicing sector, 42.4% works in industrial sector and only 14.4% works either in agricultural or the fishing sector. The local Changhua city government has a plan to expand the city from the current 12.35 km2 to 22.61 km2 with the hope to boost the standard of living as well. 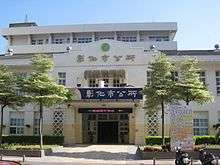 Due to Changhua city's urban nature it owns more educational resources allocated by the local government compared to neighboring townships or cities of Changhua county. 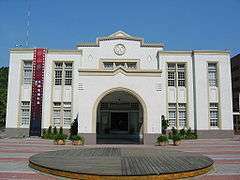 The earliest school in Changhua dates back to 1726 during the Qing dynasty. In addition, the Japanese also improved the education system in Changhua city during World War II. As of the time this is written, Changhua city owns 15 elementary schools, 7 junior high schools, 7 senior high schools and 2 technical/universities. Changhua Station is currently the only Taiwan Railway Administration in Changhua city. National Highway 1 connects Changhua city to Taichung city and this is one of the primary route for commuters between Changhua city and Taichung city as well. National Highway 1 intersects with National Highway 3 at Changhua and connects to Provincial Highway 74. On 25 May 2002 China Airlines Flight 611 broke into pieces in mid-air. Parts of the plane landed in Changhua. Wikimedia Commons has media related to Changhua City. ↑ "Changhua City Office: About the Mayor". changhua.gov.tw. ↑ Davidson, James Wheeler (1903). The Island of Formosa, Past and Present : history, people, resources, and commercial prospects : tea, camphor, sugar, gold, coal, sulphur, economical plants, and other productions. London and New York: Macmillan. p. 261. OL 6931635M. ↑ Davidson (1903), p. 597. ↑ "National Changhua University of Education - NCUE". educations.com. 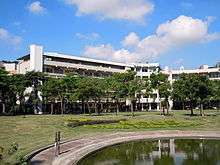 ↑ "Chienkuo Technology University, Changhua 建國科技大學". tealit.com. ↑ "1895 Baguashan Anti-Japanese Martyrs' Museum - - Attractions - Travel in Changhua County". chcg.gov.tw.